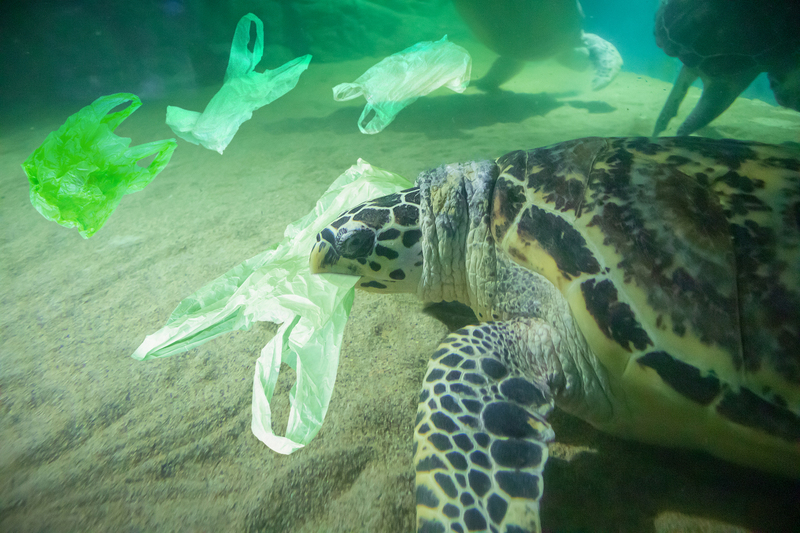 Increasingly we read plastic is a hazard to the planet, choking landfill and defenceless sea creatures like turtles and shellfish. But where’s the coverage of the human Health and Safety dangers of plastic packaging? Shrink-wrapped, atmosphere-protected, pull-the-tab, tear-here packaging ‘re-sealable for your convenience.’ Forgive my cynicism: it’s not for your convenience, it’s for supermarket chains’ convenience. Pre-weighed and pre-packed food is pallet-friendly for warehouse and lorries and national distribution. I am nostalgic for the time when you could buy just what you needed, not so much you’d end up dumping half as unconsumable by sell-by date, when fewer trucks trundled the countryside wrecking roads, the atmosphere and killing local shops, when greaseproof paper and brown paper bags ruled. I applaud some supermarkets now have ‘loose’ produce so you can buy only two carrots and re-use your own bags; more need to. But it’s not just roads and livelihoods being damaged: it can be people. I’d like a campaign against exasperating packaging which is Harmful to Health! It’s Sunday breakfast. Some bacon? A sharp-edged plastic non-recyclable vacuum pack- ‘pull at corner’ for access. Even if you can get a nail under the corner tab, it doesn’t budge: sealed with the Devil’s spittle. First blood of the day: cut finger. Pity help you if you are in a holiday caravan without scissors or a pointy knife. An egg sunny-side-up? God bless its shell the Good Lord gave it. If you’re lucky it’s in a re-cyclable cardboard box, if not, the supermarket-favoured popper-plastic, engineered box can be a challenge. A potato scone? Lucky folk with a local baker can buy just two in a paper poke. If not, there’s six (for 4 to go mouldy tomorrow) in a cellophane packet sealed by a serrated edge strip which never gives way. And if the cellophane is sealant-coated, it isn’t recyclable. Nor is your breakfast juice carton which if glued-topped type can be hazardous, often opening with difficulty to splash in all directions. So, it’s the twenty-first century, we’ve had a man on the moon, but they can’t offer us a breakfast that doesn’t need scissors, an Elastoplast, a pointy knife and a J-cloth? Lunch is no better. Beans? No tin openers now, ring pull cans. One bent knife, one broken nail. And often the ring breaks when only half open, necessitating a spoon. Toast? The sliced loaf comes imprisoned in often-un-recyclable plastic bag whose ‘sell-by-date’ tag is glued to itself by more Devil’s spittle. Add to cooking utensils required: an old knife you don’t mind bending, a nail file, a teaspoon. An afternoon cuppa and biscuit with the feet up (if you’re lucky). Teabags? A cardboard box, imprisoned in shrink-wrapped Barlinnie-cellophane whose gold overlapping strip breaks on ‘pulling here.’ More Satanic glue, needing pointy knife again. A wee sonsie Chocolate digestive? Ah, a cardboard box without cellophane, but don’t be fooled, inside lurk biscuits trapped in more glued cellophane which on sharp tugging scatters biscuits in all directions. Oh for the days you could buy biscuits out of open boxes in Galbraiths, though the way-home-from school broken cheap biscuits weren’t any good for dunking. Hmm, neither are my smashed digestives. Milk for the tea? Less ‘Pinch ‘n Pour’ now thankfully, more screw tops though they can be difficult to get a purchase on being twisted on as tight as Scrooge’s breeks. Jumbo plastic bottles are easier, but not all re-cyclable. Sigh. By 4pm I’ve used scissors, pointy knives, J-cloths, a dustpan, brush- and the odd cathartic swearyword. Some nice haddock for dinner? Supermarket fillets come trapped in a plastic, vacuumed vice needing a pointy knife and care to avoid skiting the blade off into your palm (which might open up the gash already suffered removing the sharp-edged packet from the fridge). A bandage. Fry the fish? Cooking oil bottle screw top, no bother, but underneath comes a wee red plastic hoop which breaks before lifting the seal. Yup, pointy knife again… Peas now? Rarely seen fresh, so a frozen bag. Need scissors to cut along above the ‘handy self-seal’ strip. A dynamite pack this: how come there’s such a bonanza of rogue peas in the freezer drawer if the bag is self-sealing? By 6.30 pm I have now used multiple pointy knives, scissors, cloths, brushes, a pea scoop and possibly the car (to get hand stitched at Casualty). Plus several paracetamol. Or Valium. Then a parcel arrives: cardboard. Good for the turtles, but its brown sticky tape’s a Health and Safety hazard for humans. Sealed up tighter than a badger’s arse (cathartic swearyword), pointy knife to the rescue, it springs open. The house looks like a snowstorm globe from Blackpool with polystyrene packing beads which mostly aren’t re-cycled. I long for the Good Old Days: bacon in greaseproof paper, crusty bread in tissue, biscuits in tins, tea in paper packets, peas in pods and milk in glass bottles with re-cyclable tops funding Guide Dogs. And fewer toxic diesel trucks rattling though villages with plastic-that-never-rots packages doomed to pollute land and kill wild life. There are university courses in package design for goodness sake- do they consider more than the convenience of Big Business? Surely it can’t be rocket science to make packets that don’t need wee pointy knives?